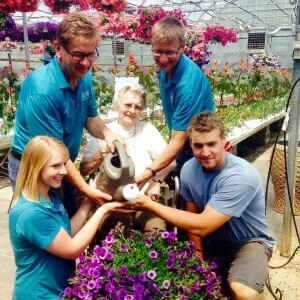 About Us | Westside Nurseries & Greenhouses Ltd.
Westside Nurseries & Greenhouses is a family owned business since 1964, with our roots being set deep in the community of Owen Sound as well as the surrounding areas. We are working towards a successful future with our 3rd generation actively involved in our continued growth. Westside Nurseries is the largest garden centre around, with over 18,000sq ft of greenhouse space, where we grow large volumes of our own bedding plants, ensuring our customers receive the highest quality plants available. We also offer the best nursery stock and other product lines from premium suppliers such as Oaks Precast and So-Green Fertilizer. Boasting over 2000sq ft of retail store space filled with many gift ideas and gardening products, we are much more than just a greenhouse. Our highly knowledgeable staff are able to assist you with any gardening needs you have, from answering concerns about pests or diseases, to guiding you in your garden design. Be sure to visit in mid-November when our store transforms into a Christmas Wonderland with over 4000 potted Poinsettias and other Christmas flowers, as well as one of the largest selections of Christmas trees and Greens. We are proud to say our landscaping team is the best in the area and our project managers have a true passion for their craft. Having earned degrees in landscape design and horticulture, they are able to ensure every garden is a work of art. You are in good hands with Westside Nurseries & Greenhouses ltd.
Have a question or need some advice? Come on in or give us a call and our knowledgeable staff will assist you!